This case challenges the MTA’s failure to maintain the few elevators that exist in New York City’s subway stations. DRA has a second, related case challenging the MTA’s failure to install elevators in all stations. On April 25, 2017, DRA filed a class action lawsuit against the New York City Transit Authority (“NYCTA”) and the Metropolitan Transit Authority (“MTA”) for failing to ensure programmatic accessibility of the City’s subway system for people with mobility disabilities by not maintaining the already limited number of stations’ elevators. On average, there are approximately 25 elevator outages per day, with median outage lasting 4 hours and with many outages lasting for months at a time. Defendants further compound these issues by frequently failing to inform the public about outages, by not providing signage to describe alternate accommodations and/or accessible routes, and by not ensuring alternate transportation for people who cannot use the subway unless elevators are functional. 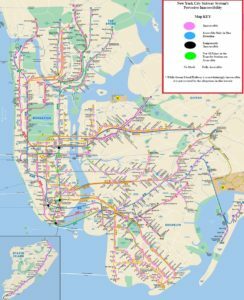 Because the number of accessible stations is already at the abysmally low 22 percent rate of the total number of stations, the frequent and lengthy outages at the few stations that do feature elevators effectively exclude people with mobility disabilities from accessing the City’s subway system. This exclusion has a profoundly dire impact on their ability to participate in the City’s economic, political, cultural and social life given the paramount importance of subways in residents’ lives. DRA’s ultimate goal is to ensure that the Defendants meaningfully address this exclusion by instituting a comprehensive remedial scheme that will lead to regular operation of usable and sanitary elevators and to provision of adequate notice and alternative accommodations when outages do occur.